Disney is discontinuing the sales of Disney Dollars after almost 30 years. The final day to purchase the soon-to-be collector’s item is May 14, 2016, due to the increased use of gift cards and other digital media. There is no expiration date on Disney Dollars, so they will still be an accepted form of currency at all Disney Theme Parks and the Disney Stores. Disney’s Earffel Tower removed overnight! Breaking NEWS! Disney’s Earffel Tower at the Hollywood Studios was removed last night! it was announced on January 15th that this iconic tower was going to come down to make room for the new Toy Story Land, but the date was never announced… well that date was last night. No fanfare or farewell, just gone. Au revoir Earffel Tower! Ample Hill Creamery at Disney! A re-imagined take on the turn-of-the-century ice cream parlor is set to open this spring at Disney’s BoardWalk Inn & Villas at Walt Disney World® Resort. Ample Hills Creamery, a Brooklyn-based company known for their creative approach to all things ice cream, will open its first location outside of New York City. The new creamery will be located on Disney’s BoardWalk, overlooking Crescent Lake—a short walk from Epcot® and a relaxing boat ride from Disney’s Hollywood Studios®. Guests will be able to peek into the promenade-facing kitchen windows, where ice cream and mix-ins will be handcrafted the old-fashioned way. Inside, you can sample as many flavors as they’d like, including signature creations like Ooey Gooey Butter Cake, Coffee Toffee Coffee, (my personal fav, can’t wait to try this!) Malty Salty Pretzel Punch, Cotton Candy, and more. They’re even working on a special one-of-a-kind flavor developed exclusively for Walt Disney World Resort. FREE DINE! It seems EVERYONE wants and/or waits for Walt Disney World to offer (what now has become) the traditional fall offer for FREE Dining Plan! Well it’s open for booking as of this morning, April 25th! Woo-Hoo! Now for the other news… Disney has also announced 3 additional money saving offers! Go figure – Let’s make everyone’s life just that much more complicate d – Right? Everyone assumes that the best value is going to be Free Dine. However, this will not necessarily be the case. You have to be smart about it all. Dates, rates, Resorts, length of stay AND the dining plan choice itself ALL play a major factor in the final cost. When you decide to stay at one of the Disney Value Resorts, you will automatically get the Quick Service plan with the Free Dine offer. You can upgrade to the Disney Dining plan that includes the Table Service option. If you decide to stay in one of Disney’s Moderate, Deluxe or Deluxe Villas, then the Disney Dining Plan (one Table, one Quick and one Snack service per person, per night) will be the dining plan included in your package. Yes, you can even upgrade to the Deluxe plan from there. Now, the 25% off the room rate can save you more money depending on which Resort you stay in. Staying in a Deluxe Resort with this offer and adding a Quick service plan can be a better value to you in the long run. Even staying in a Deluxe Resort in the Club Level (with access to the Club Lounge which offers breakfast, snacks throughout the day, evening cordials and desserts) can fill in making the Quick Service Plan a winner. Oh LaLa! Enjoy a 2-day/3-night stay in a standard room at a select Disney’s All-Star Resort with one park per day Magic Your Way® base tickets for just $998 for a family of 3. Book by August 31, 2016 for stays most Sunday through Thursday nights from August 1 through November 5, 2016. Enjoy a 4-day/4-night stay in a standard room at a select Disney’s All-Star Resort with one park per day Magic Your Way® base tickets for just $1,850. Book through August 31, 2016 for stays most Sunday through Thursday nights from August 1 through November 5, 2016. Tutto Italia Ristorante in EPCOT offers special 3-course prix fixe lunch! Tutto Italia is one of our favorite restaurants, along with Tutto Gusto Wine Cellar and Via Napoli. But normally these places are thought of more for dinner than for lunch. Mostly because World Showcase doesn’t open until 11:00 am and the majority of guests are still lingering in Future World due to the fact that this area has the majority of the attractions the kids are more interested in and the scheduling of FP+ will cause you to still be in Future World about lunchtime. This is a shame, because amazing world class dining is in World Showcase, and having both lunch and dinner reservations (for lunch sometimes walk-up is possible too) would thrill any foodie!! Most lunch menus are the same as the dinner menus, just less costly! You have your choice of four appetizers: Antipasto, Insalata Mista (salad), Caprese (mozzerella, basil and olive oil), and Minestrone soup. For the main course select between: Scaloppine di Pollo (chicken scaloppini, cremini mushrooms and marsala sauce), Filetto Di Sogliola (parmesan encrusted filet of sole with spring salad and citrus vinegrette), Chicken Ceasar Salad, and Spaghetti with meatballs. For $27 plus tax and tip, this is very reasonably priced, compared to other options when looking at table service restaurants on property. We would recommend considering paying out of pocket for this, and not using your dining plan UNLESS you have dining plan options to spare. Be aware, however, this prix fixe lunch is for a limited time!! Starts on May 3rd and runs through August 31st. Just in time for Epcot’s Food and Wine Festival to start! Magic Itineraries Vacation Planning Professionals can help book this venue into your itinerary, help you decide if using your dining plan option would benefit you or not and help you select other great dining options as well! Contact us today!! Enjoy Breakfast, Fly With Peter Pan, Explore the Seven Dwarfs Mine and More During Disney Early Morning Magic – who wants to pay extra for this experience? Fantasyland looks even more magical in the golden light of morning, and now Disney Early Morning Magic presents a new option perfect for people who want to get an early start at Magic Kingdom® Park – but it will cost you extra for the opportunity. The Disney Early Morning Magic package will allow a very limited number of Walt Disney World® Resort Guests to be among the first to enter Magic Kingdom Park where they’ll enjoy a hearty breakfast Pinocchio Village Haus and experience three of Disney’s favorite Fantasyland attractions. Most everyone who’s ever visited Walt Disney World, especially with young children, will tell you that Peter Pan’s Flight ALWAYS has long lines and wait times. It’s an attraction that one should always attempt to get a FP+ for. Same is also true for the Seven Dwarfs Mine Train attraction. From the day of it’s opening, less than a year ago, long wait times and “sold out” FP+. So, to have quick access to Peter Pan’s Flight, Seven Dwarfs Mine Train and The Many Adventures of Winnie the Pooh, may be of great value to purchase the Disney Early Morning Magic ticket just for the chance to get on these 2 attractions alone without lines and wait times – plus breakfast – win-win, right? Disney Early Morning Magic requires a separate ticket – $69 for adults and $59 for children ages 3-9 (plus tax) – in addition to regular theme park admission. Disney Early Morning Magic will take place on select dates (Tuesday’s and Saturday’s) from 7:45-10 a.m., beginning April 26, 2016. We think this option has value to some, but it’s not for everyone. It seriously depends on your value of time, money and what you want most from your Disney experience. We have to say too, that we think $59 for children 3-9 is rather steep! We can help you plan your Disney vacation to include this Early Morning Magic ticket or not. Remember that there’s also the option of the new Disney After hours ticket, allowing you to enjoy the Magic Kingdom on select nights for 3 hours after regular park closing! Dates for this event are April 14, 21, 28, May 5, 8, 12 & 19. Tickets are on sale now. 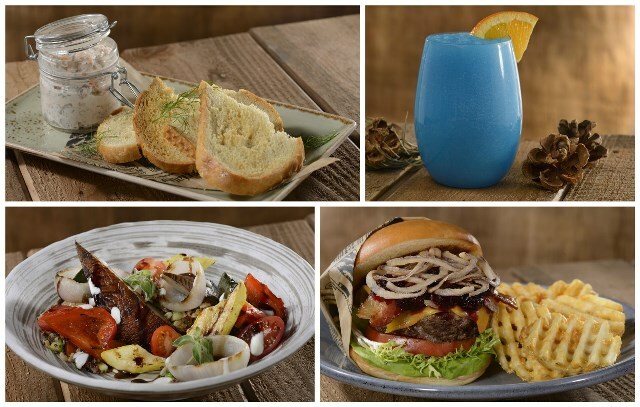 Liberty Tree Tavern & ‘Ohana – Recipes! It’s a New England style clam chowder, which means it’s made with milk and ends up creamy instead of brothy in the end. This delicious goodie has been a staple on the Liberty Tree Tavern menu for years, and it’s a guest favorite. In a 4-quart saucepan, melt butter or margarine. Add celery, onions, and green peppers. Saute about 5 minutes until tender. Add flour and cook an additional 5 minutes to form a roux. Stir in clam juice, chopped clams, and milk and bring to a boil. Reduce heat immediately and simmer for 15 minutes. Continue stirring while chowder thickens. Season with thyme, salt, and pepper and add cubed, cooked potatoes. When potatoes are hot, serve immediately. character buffet breakfasts to a crowd pleaser to guests of all ages. Place a layer of potato slices and onion in a buttered shallow dish. Sprinkle with some of the cheeses and salt and pepper. Repeat layers and then pour cream over the potatoes. Bake at 350 for 1 hour and then let stand 5 minutes. While the there are many Special Tours throughout Walt Disney World® Resort property to experience, Magic Itineraries recommends that you take a look at ALL of them before deciding which one or more are the right ones for you. We never recommend first time Disney guests taking a “Behind the Scenes” tour – it’s not a good idea to “reveal” any on the secrets to the magic until you’ve had a chance to be totally immersed in all the Disney Magic, at least once. For the Disney Fan, Disney Vacation Club members, Annual Pass Holders and those lucky people who visit the parks multiple times, then we recommend enjoying many of these great tours. Beware that most have age restrictions (age 16 usually is the youngest allowed for most) and some can be costly. Several take most of the day and can include lunch or breakfast. Below are theResort Tours – the first two (2) are the newest ones available. This 3.5-hour-long breakfast and tour is designed to immerse guests in the richness, culture and history of this African-inspired resort and give a backstage peek at the care, feeding, well-being and social interactions of the resident animals. The experience will be offered on Tuesday and Saturday mornings. The cost is $249, and staying at Disney’s Animal Kingdom Lodge is not required. Experiences may vary. Experience the charm of Southern Florida during the turn of the century and see how it shaped the heritage and culture of the Resort during this one-hour walking tour. Travel through time and discover the hotels and individuals who inspired Disney’s Grand Floridian Resort and Spa. This tour includes a behind-the-scenes look at the spectacular 5 star restaurant, Victoria & Albert’s. The Floridian Express is offered Tuesdays, Thursdays and Saturdays. The tour departs around 9:00am and is limited to 10 Guests. Price is $15 per person (plus tax). This tour is available for all Guests ages 10. Witness the wild as it comes to life in complete darkness during this thrilling, hour-long expedition. Set out for after-dark adventure on an exclusive safari experience, reminiscent of an African game drive through the savanna. Guests will have use of night vision goggles to make the most of their viewing experience. The Starlight Safari is offered daily at 9:45pm. The safari departs around 10:00pm.and is limited to 10 Guests. Price is $70 per person (plus tax). A portion of the tour price is donated to the Disney Wildlife Conservation Fund. This safari is available for all Guests ages 8 and up. This 90-minute safari experience at Disney’s Animal Kingdom Lodge resembles an African afternoon game drive. Guests will be able to learn about the natural history and management of the animals and architecture of the resort. The safari is offered daily and begins with a pre-safari reception from 3:30 p.m. – 4:00 p.m. The safari departs at 4:00 p.m. and concludes at Jiko for a multi-course meal. The tour cost is $190.64 per person (price includes tour, meal, tax and gratuity). Not available for Guests under the age of 8. (Not included in Magic Your Way Packages). The Wanyama Safari and Dinner can only be booked by the itinerary planning office or Concierge at Disney’s Animal Kingdom Lodge. Are you planning on hitting the water-parks at Walt Disney World® Resort this year? There are 2 of them and they make for a great addition to your family vacation. Check the water-park options out below and see what you’re in for when you hit the Florida sunshine! This is one of the popular water-park areas at Disney for a cool day in the hot summer sun. There’s a variety of rides including water slides, a children’s play area, with age appropriate body slides and raft rides and ever popular the lazy river, Castaway Creek. Test your thrill limits on the Humunga Kowabunga or visit the less intimidating Mayday Falls, Gangplank Falls or Keelhaul Falls! Body Slides are fun too at the Storm Slides. If you would like to have an up close and personal animal encounter then head over to Shark Reef. Another great location to cool down during the hot Florida summer is at Disney’s Blizzard Beach. This is an exciting water-park adventure just waiting for you and your family with Christmas tunes playing in the background! Grab a bite to eat at the variety of shops located on-site after you’ve enjoyed the Cross Country Creek or Runoff Rapids. There’s also the Snow Stormers, Summit Plummet and Teamboat Springs that are sure to please. In the kids area you’ll find Tike’s Peak with pint sized slides and activities for the little ones. You’ll also find Polar Patios and umbrellas throughout the park to help you keep cool when you’re not in the water. One of the easiest ways to get the most out of any of your Disney trips is with the authorized Disney vacation planners at Magic Itineraries. You can make the most out of your family vacation by taking the time to allow the authorized team to assist you. They know the behind the scenes details at each of the park locations that can make or break your trip. They can inform you of the Extra Magic Hours for Resort guests only, the best times to hit character dining, and when the peak times to avoid are. They can even get discounts and better prices on dining, accommodations and traveling than you can by yourself. Work with one of the experienced travel professionals at Magic Itineraries today to get your family vacation planned. Be sure you discuss with them any unique situation you have so they can help you accommodate these needs. They will be able to book advance dining and show reservations, select and schedule FastPass+, create a customized itinerary, and help you make sure everything is taken care of. They take the stress and hassle out of planning so all you have to do is enjoy your vacation. The talented team has been planning family vacations like yours for years and they can help you make the most of any visit to and Disney Destination. When visiting Walt Disney World® Resort, whether you want to visit the water-park areas, Magic Kingdom or Animal Kingdom, Magic Itineraries is the agency you want. You can rest assured your family will make lifelong memories seeing their favorite characters in person, experiencing amazing shows and exhilarating attractions. Call or explore the website today to start planning your one of a kind vacation. You’ll be glad you did when you are enjoying your time away and your friends are still frantically planning their family vacation. Do you have a dream Disney vacation in mind? Are you planning a romantic getaway for just the two of you or a family reunion? Perhaps it’s the Disney honeymoon you’ve always dreamed of or the kids are the right age to take them for their very first visit to meet Mickey Mouse or their favorite Disney Character they’ve been watching on the Disney Channel! How can you make this the most perfect Disney vacation? Work with the amazing team at Magic Itineraries! We have years of experience in planning just the right trip for all types of travelers. Whether you’re interested in a Disney cruise, heading to Disneyland or want to know more about an Adventures by Disney guided tour, we have the knowledge you need to help you make the most of your Disney experience. It takes a lot of work to become an Authorized Disney Vacation Planner agency and that is just what we have done. We have also gone through all the College of Disney Knowledge courses and qualifications. We work diligently to assist you in finding the best money saving package and Resort to best fit your needs. Our customized itinerary services will plan and book your advance dining reservations, including character experiences, park strategies, advance FastPass+ scheduling and the best park the visit on the best days so you don’t miss a minute of the MAGIC! Working with our team will help you make this the most fun and exciting trip you’ve ever experienced, first timers and seasoned Disney fans alike. Let’s face it. When it comes to planning your perfect Disney experience, there’s a lot that goes into it. Resort Packages and reservations. How many days tickets do you need and which options are best? Do you stay on site or off? Dining Reservations? Is the Dining Plan of any value? What about the Extra Magic Hours for those who stay on-site? Is it worth it? Don’t forget the FastPass+ system! This is something you want to investigate for much less wait time in line. These are all asked and good questions – we have the honest answers. All of this and so much more information comes at you quite fast and it can be difficult to know where to start. Working with our certified Disney planning Dream Maker team can help you sort through all of that and ensure a perfect adventure. So whether you’re to head to Disneyland Resort, the sunny sites in Florida at Walt Disney World Resort, heading for the open seas on the Disney Cruise Line, want to experience the world with Adventures by Disney or relaxing in paradise in Aulani, a Disney Resort in Hawaii, we have you covered. Call our office today or explore our website to see more ideas of how we can make your Disney vacation planning seamless. You won’t regret working with these highly trained and experienced travel professionals to take the hassle out of planning your Disney vacation. Planning the perfect Disney Vacation can be difficult when you look at all the exciting things to do. When to go? How many days? Best package? Best ticket options? There’s even more fun in choosing the right resort to stay at. There’s the character dinners, the meet and greets with your favorite Characters, and the endless choices of parks and restaurants. How can you choose the perfect events and Disney itinerary for your family making sure not to miss any of the magic? It takes a ton of time? Who has all this time? What’s the answer? Find yourself an Authorized Disney Vacation Planner. What makes an Authorized Disney Vacation Planner? Most any travel agency could easily help you find a hotel and get you on a plane. The difference in an Authorized Disney Vacation Planner and your ordinary travel agency is the knowledge and experience. In 2004 Disney began the Authorized Disney Vacation Planner program and selected the top 10% of their travel agencies for this honor. Magic Itineraries was among the few agencies in the country to be selected for this honor and has continued, each year, to be invited back to the program. It’s the distinction we’ve earned and the distinction you deserve. Our experienced team has been planning the perfect family vacation to the land of magic for families just like yours for 15 years. We have worked helping to customize family trips to Disneyland Resort, Walt Disney World Resort, Disney Cruises, Adventures by Disney and vacations to Aulani, a Disney Resort in Hawaii. We know the ins and outs and can help you find the perfect resort that fits your unique situation. Why pick an Authorized Disney Vacation Planner? When it comes to planning your Disney Itinerary, Magic Itineraries knows the tips and tricks to get the most out of your trip. As an Authorized Disney Vacation Planner, we can help you get the most out of every moment. plan disney trip with us, be it relaxing or squeezing more into every minute! Let our team make your next Disney Vacation a dream come true. Call our office today or explore our website to find out more. We can help you bring smiles to your children’s faces and the kid in you, enjoy all the magic of Disney. Whether you want to visit one of the parks, take a fun family cruise or so many more magical Disney Destination options, our team has you covered. Get ready for the time of your life! Have a MAGICAL Day! In most cases, turning your dreams into a reality seems to take forever, especially if it is a vacation that you have longed to take. The more you talk about it, the longer it seems to take to actualize. One thing that makes this harder is planning and making sure everything goes right. Especially if you are the parent, you never want your children to go on a vacation they have been dreaming of only to end up being disappointed with the food, hotel and sites to see. Dreaming of a Disney land vacation is a big thing that you want to be without hitches and glitches. Allow Disney Magic Itineraries to plan for you. Anyone who has been to Disney knows just how many activities it has, and coupled with the sites to visit, planning for this can be a tall order. Even harder is sieving through the elaborate information available on the Disney website as you try to get what suits you. The situation even gets worse for someone who is planning to go to Disney for the first time. There is no need to put yourself under immense stress as Magic Itineraries has the capability to simplify your itinerary allowing you to enjoy the best time at your dream vacation. Our planners are very knowledgeable in what Disney offers since they have handled such experiences before and understand the Disney destinations. They constantly ensure that their knowledge of Disney is refreshed for new ideas and sites that will make sure you have the best time on vacation. When you allow our travel planners to assist you, they share the knowledge that gives you more ability to decide better. As we plan a Disney trip, we ensure that everything stays within your budget. This helps you avoid unnecessary surprises that you might meet while on vacation. Our priority is to ensure you have the best time, but stay within the budget. The Disney vacation packages we offer are the best around. We do all the labor on your behalf to ensure you get the best accommodation, parking, and means of traveling to and from Disney. When you allow us to be your Disney vacation planners, we inform you of any discounts and special offers available. This includes even the special events that might interest you or your family members. With Magic Itineraries , you are in safe hands as we are among the planners authorized by Disney to do so. Before going to Disney, everyone wants to know what is so special about the place. Everyone tries to imagine what to expect on the dream trip. Until they get there, their planning is full of uncertainties that can only be quenched by Disney. However, getting to Disney is not an easy thing for everyone; it involves a lot of planning, a number of bookings and fear of ending up in Disney and not enjoying the time you spend there. The best way to handle this is to allow someone else to do the job for you. Disney Magic Itineraries exists for that sole purpose. Planning Disney Itinerary As a travel planner, we ensure that we offer you the best rates, we research for the best accommodations, activities and sites to visit. We expose you to numerous special events that Disney offers along with special offers on the same events. In case there are discounts, we bring them to your knowledge to ensure you spend the least, yet get the most. Our knowledgeable team will be planning your Disney itinerary with vast knowledge and experience having organized trips for different types of visitors. If you are interested in knowing a few special events Disney offers, below are some. Enjoy your time cruising the most stunning destinations around the world as you take time off a season of hard work. Visit places such as the Bahamas, Alaska, California and Baja served by the most experienced crew members. The best part is, as you visit the places, you do not have to worry about accommodations as the cruise ship becomes your home throughout the vacation period. While on board, you can use different facilities such as youth clubs, dining, nightclubs and lounges, spas and recreation, shopping, and Disney cruise line special events. If your Disney Vacation Package involves staying on land, there is so much fun at the resort as you visit places. The first class amenities at the resort will improve your quality time. You can choose to be amazed either at Disney California Adventure or the legendary Disneyland Park. Disney California Adventure offers the 12-acre Cars Land, which is inspired by the Disney Pixar movie Cars. For those in love with Disney characters, then Disneyland is the place for you. A few steps from the hotel is the Downtown Disney District, which offers great entertainment, dinning and shopping. The best part of Disney is that it has numerous activities and sites to visit. This is a good thing, but for the best experience, it’s great to have an authorized Disney vacation planner on your side. When you want the true Disney vacation experience, where’s the best place to be? Well, the Magic Kingdom® Theme Park is one of the first options that come to most people’s minds! This is where the iconic Cinderella castle is! There’s so many sights and sounds just waiting to be discovered at The Walt Disney World® Resort! Here are a few of the highlights of the Walt Disney World® Resort and what you can expect on your family vacation. Staying at a Walt Disney World® Resort will give you so many “extra” benefits! Taking advantage of the Extra Magic Hours means select parks are open on select mornings, 1 hour early and up to 2 hours late on select evenings after the park closes to the general public – just for Resort guests! You can ride attractions, enjoy the restaurants or just stroll around the park meeting your favorite characters. Disney’s Magical Express complimentary transportation to and from the airport, for both you and your luggage is another benefit! From the moment you walk through the gates you’ll start seeing your favorite characters. There are meet and greet stations set up throughout the area to help you find your beloved Mickey, Minnie and even Donald Duck! Don’t forget Tinkerbell and Periwinkle! Children, and adults, of all ages will enjoy getting photos with their favorite characters. Check the Times guide for details on locations and times. Also, FastPass+ are available for many Characters and can be scheduled in advance through MyMagic+ and MyDisneyExpierence once your set up your account. Magic Itineraries can help you with ALL these details!! When it comes to rides, adventures and entertainment, there’s no shortage in the Magic Kingdom®, Epcot®, Hollywood Studios® or the Animal Kingdom Theme Park! In the Magic Kingdom® alone, take off to outer space in Space Mountain® or face the pirates and Yo-Ho, Yo-Ho at the Pirates of the Caribbean®. Brave 999 Haunts at the Haunted Mansion® (there’s always room for 1 more!) or spend time flying with Dumbo, the Flying Elephant®! Don’t forget to head over to Adventureland® and fly on The Magic Carpets of Aladdin® or experience the Tomorrowland Transit Authority PeopleMover. There’s also Under the Sea~Journey with the Little Mermaid with Ariel and the ever popular Country Bear Jamboree. When it comes to planning your family vacation, we’ll help you select the best attractions for you and your family! It’s all about time together and not wasting a moment of this precious commodity! While you certainly can plan a visit yourself, a Disney Travel Planner can help you take the stress and hassle out of all the family vacation details. Here at Magic Itineraries, Authorized Disney Vacation Planner, we know the ins and outs to get you the best adventure ever. We can help you find discounted rates, the best times for your dinner reservations and how to utilize the FastPass+ system to your advantage and create a Custom Disney Itinerary just for you and your Dream Disney Vacation! Call our office or email today and let us help you get on your way to a fun-filled family vacation like never before. Don’t waste a minute or miss any details! Let our staff put our years of experience to work for you! It is time to start planning your family vacation for this summer. There’s so many places to choose from and so many adventures to take. Perhaps you already know you want to take your dream Disney Vacation this summer. You’ve been talking about it for years and this is your year! So, how do you make it happen? How do you get the dream Disney Vacation without the hassle and stress of planning it yourself? You work with our wonderful team here at Magic Itineraries. We offer hassle and stress free planning of every single detail of your Disney adventure. We are an authorized Disney Vacation Planner so we know exactly what it takes to have the best time in this magical land. We know the ins and outs that make your trip fun and exciting. We understand the details that go into planning and help you decide on items such as character dining opportunities, where to stay during your visit, and when the best time to visit the parks is. Our travel planner will take you through each step and make sure that everything you’ve ever dreamed about your vacation will come true. If you’ve ever looked at the Disney website, you’re probably overwhelmed at the sheer volume of information there is available. From the insider sites and tips to the Disney web pages themselves, there’s so much to take in and process in the planning stages. That’s where we come in. We can sift through the information for you so that you can just enjoy your family trip. Our travel representatives have a vast amount of experience in planning a Disney itinerary that will perfectly fit your family. You’ll find that with our team you can get a better deal on your Disney Vacation Packages as well. We work hard to find the best prices on travel, hotel stays, and even the park tickets. We can help you set up the best vacation package to fit your needs and your budget. Start planning your ultimate family vacation today by contacting our friendly and helpful travel planners. Let us take the stress out of your vacation planning and help you enjoy your time together as a family. You can have your ultimate dream vacation this summer with no stress and no hassles of having to do the planning yourself. Get ready for your trip by talking with our representatives!